The rapidly growing municipality of San Pedro Town continues to face traffic congestion challenges. The problem is even worse during peak hours of the morning, midday and evening, when the three major downtown streets become chaotic. Making matters worse is that during these peak times, it is hard to secure parking on the major section of Barrier Reef and Pescador Drives. Long-time resident Wolfgang Wind has come up with a proposal that he recently presented to San Pedro Town Mayor Daniel Guerrero. Wind’s proposal is for a pedestrian zone with a bicycle taxi transportation system to be introduced. This will allow for Barrier Reef and Pescador Drive to be closed to traffic from 10AM to 10PM, and allowing Angel Coral Street to be open to [vehicle] vehicular traffic. He explained that this system will help address some of the traffic problems that the San Pedro Town Council currently faces. In return, it would make making the downtown area calm, charming and stress and noise-free to better accommodate the needs of our visitors and residents alike. “During the past year or two, front and middle streets saw an increase in traffic and became too dangerous for pedestrian, tourists, and even students. Middle street has no walkway. Everywhere in the world has designated pedestrian zones, and I think that if we take that concept and implement it on the island, then it can help address some of the traffic issues,” said Wind. Wind indicated that a Pedestrian Zone would transform Barrier Reef Drive and Pescador Drive into a very tourist friendly, upscale shopping area. This will give way for restaurants, coffee shops, diners, boutiques and souvenir shops to benefit more. He also said that this will eventually see hardware stores and other non-tourism related businesses slowly move out of the downtown perimeters. “Town board could rent out road/plaza spaces in front for restaurants for tables with umbrellas. Sales for tourist related businesses would go up because tourists will have more time to actually look at windows and merchandise… I have talked to business owners on middle street and they all would prefer it to be closed to traffic. It's just too dangerous. Barrier Reef Drive and Central Park would also strongly benefit. Middle Street is way too dangerous to walk without any walkway, and it feels like an accident and lawsuit just around the corner.” suggested Wind. To tie in the Mayor’s initial plan of having delivery vehicles access the downtown area at specific times, Wind’s proposal also makes accommodation for that. “Beer trucks and other deliveries can be done up to 10AM. Barrier Reef Drive (Front Street) and Pescador Dr. (Middle Street) will remain open for anyone as usual for driving, shopping and parking, daily but only up to 10am.The lot at the soccer field on back street offers plenty of parking for now. From there you only walk a minute or two to [downtown]. Bicycle taxis should be waiting at the parking lot to take tourists around town. Back Street should be the only drive-through street between north and south.” According to Wind, that will help separate incoming and outgoing traffic as often as possible to eliminate stop signs and to facilitate traffic flow. He also suggested that several tight corners would then just be for one-way traffic to avoid collision. 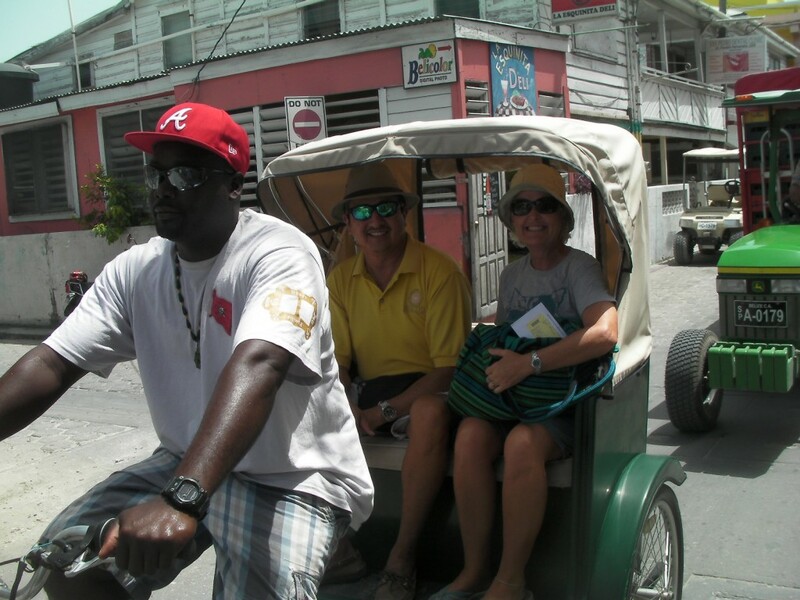 Wind said that with the amount of movement within the pedestrian zone, San Pedro will be in need of up to 30 bicycle taxis especially during high season from Christmas to Easter. In addition it is a new way to create a tourist related, quality income employment on the island. Wind shared his suggestion with the Mayor and invited him onboard just such a tricycle to experience what it would feel like around town. According to Mayor Guerrero, Wind’s idea is “workable” one that could be incorporated with other suggestions. “We have put his idea on the table for discussion. It is something that is positive and it is in line with some of the initiatives we have planned for this municipality that will alleviate the traffic problems,” said Guerrero who admitted that traffic-related issues remains one of the major challenges for the municipality. “We initially agreed in favor of certain decision that would have alleviated the traffic problems, but we have to do it by phases. When we first announced those plans, people felt we were coming down hard on them, and so we have taken a decision to do things by phases instead of all at once. The proposal that Mr. Wind has put forward is a positive one and is something we will study carefully to see how we can try to make it work along with the plans that the municipality has in place. We see that it can also be a source of employment, and so all that will be taken into consideration,” explained the Mayor. “I began thinking what it would be in two or three years with more and more traffic on the island. We are seeing more and more Polaris, golf carts and vehicles, and the island is not designed to take in more traffic. 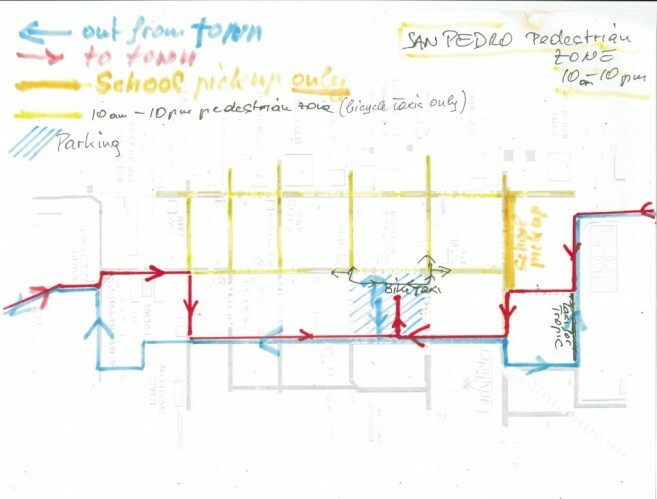 This plan will improve our traffic problems in San Pedro,” highlighted Wind. Wind explained that while being critical on issues affecting the island is good, it doesn’t help solve the problem if possible solutions are not presented. He said that if the islanders are serious about wanting to see the community move forward, they should pen their ideas along with solutions and submit them to relevant authorities.